For the second consecutive year, China has been found to be the worst abuser of Internet freedom in the world, according to a report released by human rights watchdog Freedom House. In the 2016 Freedom on the Net survey report released Monday, the watchdog said the Chinese government’s crackdown on free expression under President Xi Jinping’s information security policy is taking its toll on the digital activists who have traditionally fought back against censorship and surveillance. Freedom House researchers estimate that just over two-thirds of the world’s internet users live in nations that actively restrict online activity and that harshly penalize them, including by whippings and imprisonment, for their posts. 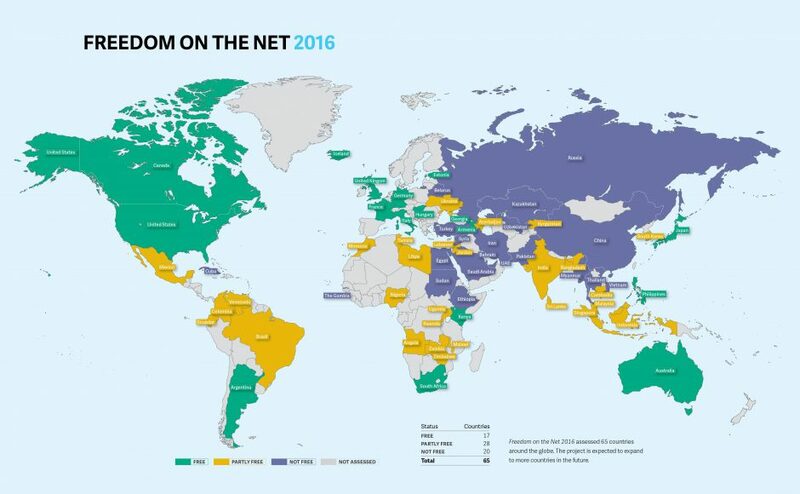 The survey of 65 nations determined that China, Iran, Syria and Ethiopia were the greatest abusers of internet freedoms, followed by Uzbekistan, Cuba, Vietnam and Saudi Arabia. Some nations – including North Korea, which has a long record of flagrant human rights abuses – were not included.